D417-CLIP ON MAGAZINE HOLDER [D417] - $39.90 : Don Hume Leathergoods, Simply the Best! 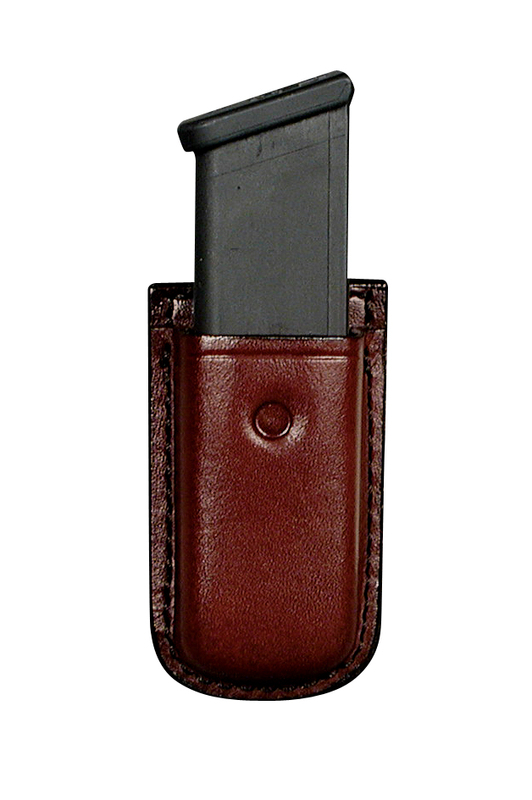 The D417 clip on single magazine holder features a sturdy spring metal clip for easy removal. The indent on the front holds the magazine in place. Carrier has an ambidextrous design and fits belts up to 1 3/4". A very nice mag pouch. The belt clip is Extremely tight and almost annoying but i can live with it. Interior for single stack mags is super tight so i sprayed some Pam oven spray inside and all is good now. maybe if the clip wasn't so tight i would have given it a 5 star. I have the one for the Ruger LCP 380. The other one i have is for a Glock 26 mag and no problems there other than the super tight clip.